Shrinking the annual Gulf of Mexico Dead Zone down to the size of Delaware will require a 59 percent reduction in the amount of nitrogen runoff that flows down the Mississippi River from as far away as the Corn Belt. 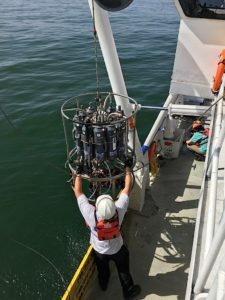 That’s the primary finding of a new study that used four computer models to see what it would take to reach the longstanding but elusive goal of cutting the size of the Gulf of Mexico summer hypoxic zone — an area of low to no oxygen that can kill fish and other marine life — by more than two-thirds. Scientists Nancy Rabalais and Matt Kupnick deploy an oxygen meter to measure oxygen concentrations within 1 foot of the seabed in the Gulf of Mexico. Rabalais has led the team measuring oxygen concentration in the bottom waters at more than 100 stations on 32 research cruises since 1985. The researchers use four computer models to predict the size of the Gulf of Mexico hypoxic zone in June forecasts issued by the National Oceanic and Atmospheric Administration, or NOAA. NOAA’s 2017 Gulf of Mexico ensemble forecast predicted a dead zone of 8,185 square miles, or about the size of New Jersey, which would be the third largest on record. 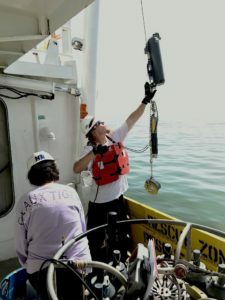 “By synthesizing information from multiple sources and computer models, we have developed the most accurate predictions of the Dead Zone, which is located in one of the most economically and environmentally important bodies of water for our country — the Gulf of Mexico,” said co-author R. Eugene Turner, LSU Boyd Professor in the Department of Oceanography & Coastal Sciences. In their PNAS paper, the researchers point out that little progress has been made in reducing either the nutrient levels in the rivers that empty into the Gulf of Mexico or the size of the hypoxic zone itself. In February 2015, the Mississippi River/Gulf of Mexico Watershed Nutrient Task Force, a coalition of federal, state and tribal agencies, pushed to 2035 the goal of reducing the Gulf’s hypoxic zone to 1,950 square miles. The most recent five-year average size of the Gulf Dead Zone is 5,410 square miles, or 14,024 square kilometers. The Task Force also agreed on an interim target of a 20 percent reduction in the amount of nitrogen flowing into the Gulf of Mexico by 2025. “The bottom line is that we will never reach the Action Plan’s goal of 1,950 square miles until more serious actions are taken to reduce the loss of Midwest fertilizers into the Mississippi River system,” said University of Michigan aquatic ecologist Don Scavia, lead author of the PNAS paper. River concentrations of the nitrate compound have not declined since the 1980s. And the current five-year running average of the nitrate load delivered to the Gulf of Mexico is not significantly different from the 1980-1996 baseline, despite the fact that U.S. Farm Bill conservation programs spent more than $28 billion in the 20 Mississippi Basin states since 1995. Research scientist Matt Kupnick guides a water sampler equipped with multiple sensors onto the R/V Pelican in the Gulf of Mexico. Potential paths toward reducing levels of both nitrogen and phosphorus include altering fertilizer application rates; using cover crops, or fast-growing crops planted to prevent soil erosion; improving overall nutrient management; pursuing alternatives to corn-based biofuels, and perennial plants cover. “It is time to ask what is preventing more extensive implementation of some or all of these strategies,” wrote the authors, who are based at LSU, University of Michigan, North Carolina State University and the College of William & Mary. In their modeling study, the researchers looked at the likely impacts of the 20 percent nitrogen reduction and concluded that it would produce an 18 percent drop in dead zone size over the long term, though it may not have a measurable effect in the next five to 10 years. 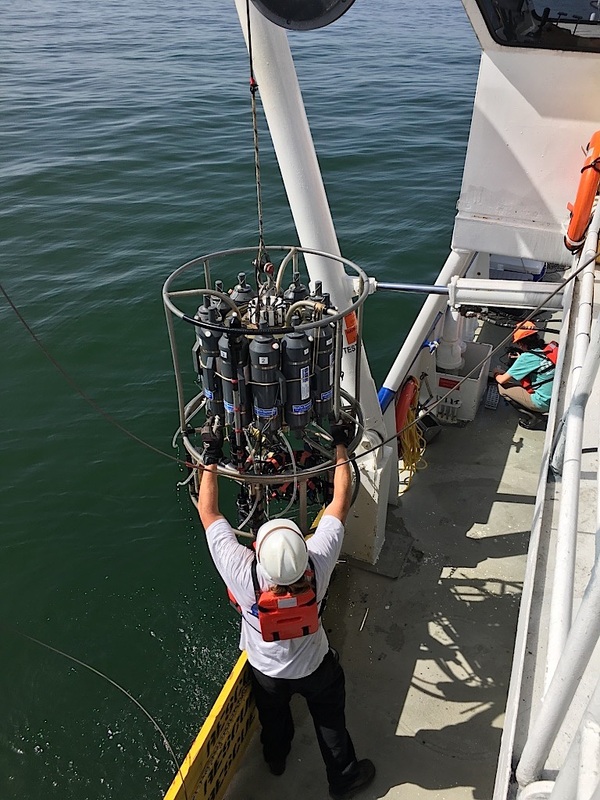 Although nitrogen has historically been considered the main nutrient driver of hypoxia in the Gulf of Mexico, a “dual-nutrient strategy” of reducing both nitrogen and phosphorus appears to be the most prudent management approach, according to Scavia and his co-authors. The 59 percent nitrogen reduction needed to shrink the Dead Zone to the size of Delaware is larger than the 45 percent cut called for in the Gulf Task Force’s Action Plan. It is also higher than recommendations made for other systems suffering from high nutrient levels, including Lake Erie and Chesapeake Bay. Scavia and his colleagues say the new study marks the first time that multiple models have been synthesized to develop a consensus estimate of how a hypoxic system will respond to nutrient-load reductions. Uncertainties include the potential impacts of climate change such as the frequency, intensity and timing of droughts and floods that are expected to change across much of the U.S. and could affect both the timing and the amount of nutrients delivered to the Gulf of Mexico. Despite the uncertainties, the team’s results show that the hypoxia zone’s response to nitrogen reductions “is robust across substantially different and independent models, providing increased confidence that the load reduction proposed will achieve management goals,” according to the authors. Co-authors of the PNAS paper, “Ensemble modeling informs hypoxia management in the northern Gulf of Mexico,” are R. Eugene Turner of LSU, University of Michigan’s Isabella Bertani, Daniel Obenour and Alexey Katin of North Carolina State University and David Forrest of the College of William & Mary.